This post is excerpted from the recent SmartBrief article entitled, "3 key insights gained in Jordan," by Paul Freeman, the Superintendent of Guildford Public Schools in Guildford, CT; and Kelly Lyman, the Superintendent of Mansfield Public Schools in Storrs, CT.
As members of an instructional team from the Neag School of Education at the University of Connecticut, we recently had the opportunity to bring our leadership experiences to practicing principals in Jordan. The trip was made possible by a partnership with Queen Rania’s Teacher Academy (QRTA), the University of Jordan, and the Jordanian Ministry of Education. The QRTA Advanced Leadership Training Program is built on four, week-long modules modeled on courses from Neag’s UConn Administrator Preparation program (UCAPP). The goal of the program is to give principals in Jordan the leadership skills they need to improve student performance at scale. Together, the partner members of this program are committed to fulfilling this deep and enduring commitment. 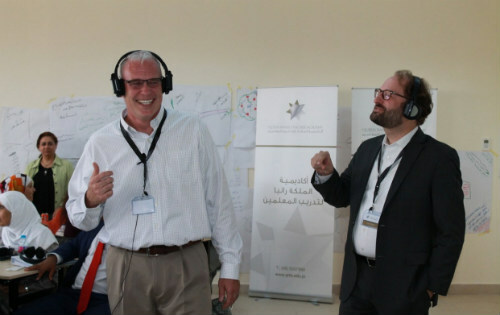 Using a train-the-trainer design, we were among four practicing superintendents from Connecticut whose goal was to give principals in Jordan the leadership skills they need to improve student performance at scale. While we were invited into this project with the goal of impacting leaders’ effectiveness in the schools in Jordan, we have come away from this experience feeling that we are better instructors for it. In a recent SmartBrief article, we shared three key lessons that we have applied as education leaders in our home state of Connecticut. We encourage you to read the full article to learn more about our experience . In addition, below are a few photos from our experience. We look forward to continuing to share about our partnership with these Jordanian school leaders. Following each day of instruction with an evening coaching session from Insight's executive coach, Jason Culbertson, drove us to reflect on our practice and our specific instructional moves so we could adjust and roll out improvements in the next day’s session. Jordan was an eye-opening experience for us both, and we were privileged to feel that we contributed to the practice of committed school leaders. One principal described her use of a four-frame tool, created from Bolman and Deal's work, as a palette with four colors of paint. From that palette, as she dipped her brush, she created new hues with which she is painting images of school improvement she had not previously envisioned. Working in a setting as new and different as the one we encountered in Jordan allowed us to see more clearly that while teaching and learning is the content of our work, it is also the process of our work. 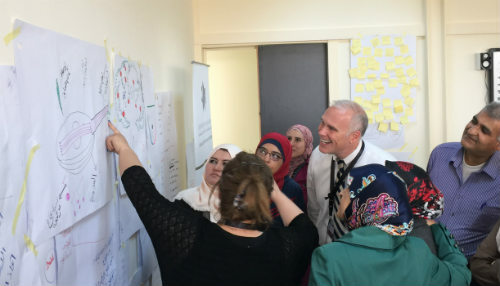 Working with the principals in Jordan, in communities different than ours, we saw with fresh eyes the challenging and organic nature of the continuous improvement process. And we both came away thinking anew about that process and those communications in our own districts. Paul Freeman is the Superintendent of Guildford Public Schools in Guildford, CT. Kelly Lyman is the Superintendent of Mansfield Public Schools in Storrs, CT. The cognitive coaching model they used in Jordan was provided by Insight Education Group, with executive coaching by Insight’s President Jason Culbertson.